I am the tallest of the four breeds known as the Swiss Sennenhunde. The other three are the Bernese Mountain Dog, the Appenzeller and the Entlebucher. Sennenhunde dogs are said to have been family pets since the time of Julius Caesar. My short black coat is marked with bronze color on my cheeks, above my eyes, and on all four of my legs. I have a white chest, white feet and a white tail tip, in addition to a white blaze on my face. I am not aggressive and I am very obedient. My size keeps me from being an ideal apartment pet, but if you have room for me, I am a great dog friend. When fully grown, I am between 25 and 29 inches tall (63.5 to 73.7 centimeters) and I weigh between 110 and 140 pounds (49.5 to 63 kilograms). 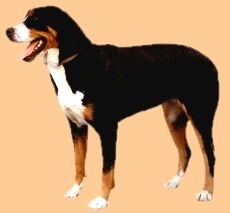 We have no Greater Swiss Mountain Dog Breeders listed at this time. Click here to place your Greater Swiss Mountain Dog Ad!